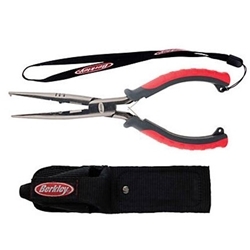 Berkley's 8.5" Split Ring Pliers features strong serrated jaws for a steady, firm grip. This split ring tool also has a built in split shot crimper. These durable pliers are sure to please with its non-slip grips and double leaf spring. Comes with a sheath for easy storage and availability.